Shaped like a whale, Mexico flips up its tail toward Cuba, a mere 90 miles to the east, revealing the belly of the Yucatan Peninsula, these days referred to as the Riviera Maya. 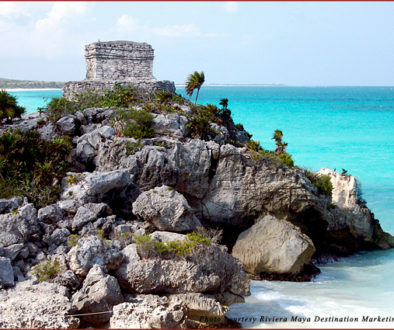 It was here that the Mayan civilization thrived in Mexico. 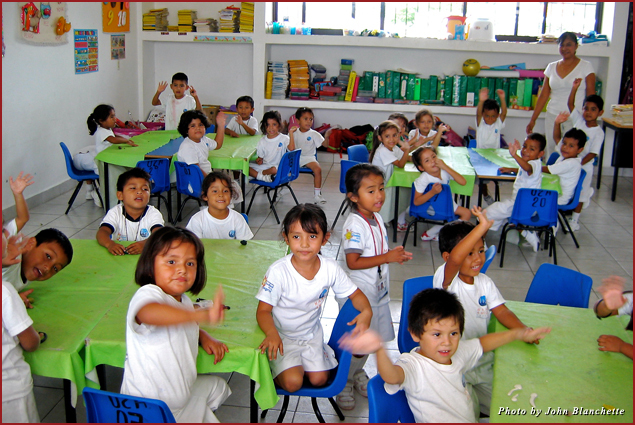 In fact, 38 percent of the Yucatan population still speaks Mayan as its preferred language. It has a distinct Polynesian sound, which many believe is the source of Mayan immigration and culture. When greeting another, phonetically the phrase is bash ka wa leek (what do you say) and the response is ma lo (fine). You arrive by air at Cancun International Airport, a four- to five-hour flight from Los Angeles, Chicago, or New York. The weather is hot and humid between May and October, and hurricanes and rain are a concern. These are the wet months, but also the months when the best deals can be found. More than a hundred weddings were booked in June at my hotels in both Playa del Carmen and Cancun. Things can get mighty romantic along the Riviera Maya. There is also a lot of singles activity, and the clubs and bars are always hopping. The beaches are phenomenal and the major draw to the area. The blue-green turquoise waters are spectacularly clear as light is reflected off the pure white sandy sea bottom of the Caribbean. The sand is soft and cool, even on the hottest days, from ground-up seashells mixed into the sand. 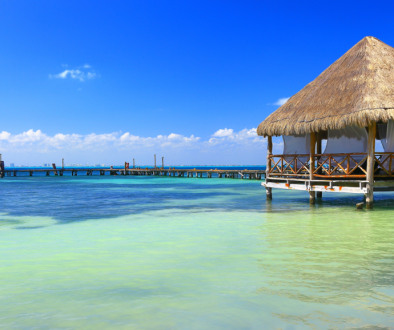 Cancun is reminiscent of Miami Beach, both in appearance and as a party town. The hotel zone (Zona Hotelera) is built on a 14-mile strip of land with a large lagoon separating it from the main city and the Caribbean Sea on the other side. The side facing the sea can get a bit dangerous when the rip tides start pulling you out. Always watch for the warning signs posted along the beach before jumping in. 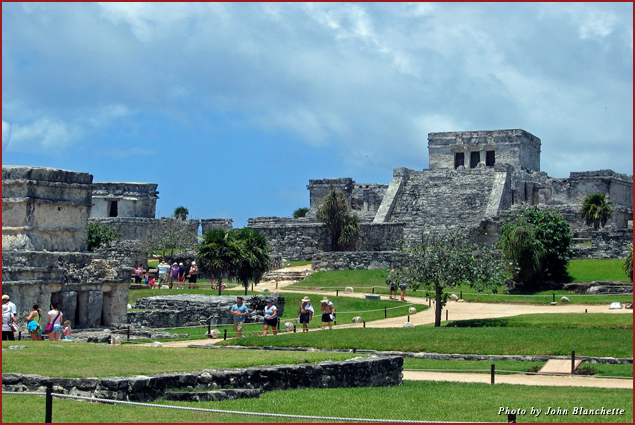 Don’t miss a trip to the Mayan ruins in the area, especially Tulum (pronounced tool-lum, with an accent on the second syllable). Guides are available to talk about the Mayan contributions to world civilization, including the calendar, mathematics (they came up with the concept of zero), hieroglyphics, and astronomical knowledge of the heavens, which heavily influenced their buildings and city layouts. The only existing Mayan ruin located on the water, Tulum is the most-visited of Mayan ruins, with two million people per year. It was a wealthy trading mecca and neutral safe harbor for the militant Mayans until the Spanish forbid boat traffic into the city and it was abandoned in the late 1500s. Today the beautiful white beaches along its coast are as popular a draw as the ruins. Jodie Foster and Leonardo DiCaprio are regular vacationers in the area and have been spotted walking their dogs on the sand. Tulum is touristy, and you are expected to give a few pesos if you take photos of locals in their Mayan outfits. It’s how they make their living. Lately there’s been a lot of fear around the Mayan calendar date of December 21, 2012. Some believe the world will end on that date. However, it’s simply the end of the Mayan’s 5,125-year-long calendar linear cycle. The Mayans aren’t wringing their hands, fretting, building arks, or digging bomb shelters. In 1967, the Mexican government started to develop the area as an international tourism destination. Before that, these towns along the Yucatan coast were primarily fishing villages and coconut plantations. 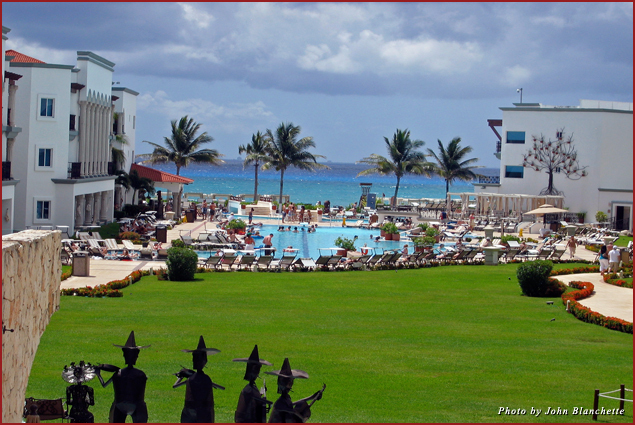 The name Riviera Maya was coined in 2000 and refers to the 60-mile coastline south of Cancun. The staff at my hotels was from all over the world, especially Europeans who came for the sun and warm waters. Large numbers of Dutch, Swiss, Italians, Irish, Germans, etc. work in the hospitality sector, and cater to many of their countrymen who vacation here in droves. In many ways it’s the new Spain for much of Europe. 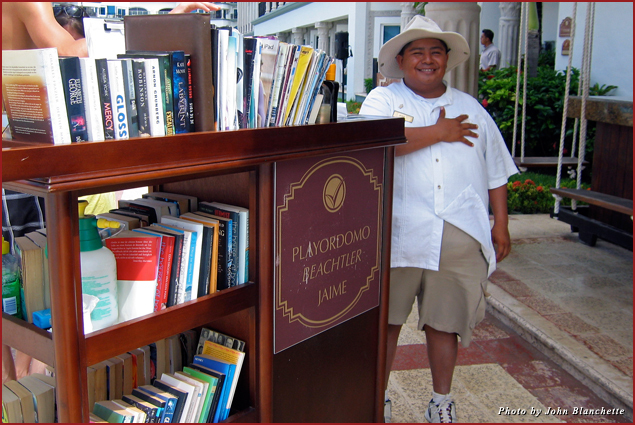 In Playa del Carmen and Cancun I stayed at the Royal hotels, both incredibly well-managed. Even in May they had an occupancy rate in the high 90 percentages. Reservations are a must. They are aligned with Best Day Travel, which has agents and drivers at the airport who will whisk you to the resorts. Enjoy beautifully manicured beaches and large sun-bathing areas adjacent to expansive swimming pools, which are attended by “beach butlers” who can provide you with a book to read or a cold drink. The cost is all-inclusive. Phone calls to the U.S. are free, along with three meals a day in the various hotel restaurants which offer breakfast, Mexican, Asian, Italian and French menus, free drinks, both alcoholic and non, and free use of the business office and computer. There is also free live entertainment ranging from concerts to dramatic performances in the evenings. The spa features a shaman who has designed healing treatments and ointments. All water is filtered, keeping Montezuma from his revenge. 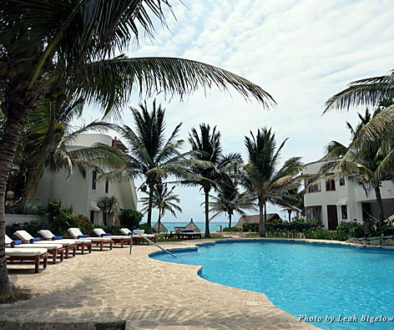 The accommodations are suites that include balconies and patios with hammocks and Jacuzzi baths. In the summer, rates begin around $161 per couple per day. Playa del Carmen’s main entertainment and restaurant row is located on a mile-long pedestrian walkway called La Quinta Avenida (Fifth Avenue). Search out Coco Bongo here or in Cancun. It’s a wild musical crossing of Hollywood films with a Las Vegas revue, live band and light show, Cirque du Soleil aerialists and everything from bar-top dancing to Frank Sinatra to Pirates of the Caribbean imitators. It’s all spiced by free alcohol once you pay the $50 admission. Shows start at 11 p.m. and finish around 3:30 a.m. It’s packed every night and it’s a kick! If you’d like to do some charity work in the community while visiting, there is a large facility called City of Joy that is promoting Voluntourism. City of Joy is a community project run by the Catholic Church that treats terminally ill patients, offers services to seniors, and operates a day-care center for hundreds of children from poor families. The facility is supported by the owner of the Royal Hotel in Cancun, who supplies free transportation to the impressive project. We were warmly welcomed and enjoyed our few hours interacting with various parts of the community. For information on hotels, restaurants, concerts, shopping, special events, guidebooks, brochures and maps, contact Cancun Travel Info and Riviera Maya Info.